Easy preschool arts and crafts that are enjoyable, help teach an idea or theme, and help with the development of fine and gross motor skills in young children. Children learn best with hands-on activities and with young children it is important to remember it is the process and not the end product that counts. Adult supervision required. On a blank piece of paper,draw a few straight lines right across the page for your preschooler to practice cutting. For further practice, draw a few zig zag lines or gently curving lines across another blank page. Some other ideas could be to draw simple shapes such as a circle or triangle for your child to cut out. 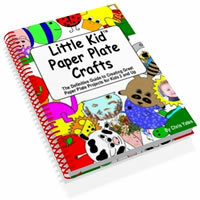 Or your child may just enjoy cutting up a piece of paper into smaller peces. Remember to use safety scissors and supervise your child. Cut a piece of thin cardboard into a shape(square, circle,star,etc.). Punch holes around the perimeter, each hole about one inch apart. With a piece of yarn, apply a piece of masking tape to one end of the yarn to give it a pointed end and tie the other end of the yarn to your cardboard. Have your child practise threading the yarn through the holes around your cardboard shape. Playdough is a great sensory craft that kids love. It's fun to squish, squash and create with. 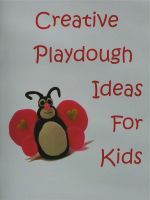 Scented playdough adds another enjoyable element to stimulate a child's senses. In addition to just coloring with one crayon try "bundle" crayon coloring. Tie a bundle( 5 or 6 ) crayons together with an elastic band and color or draw on paper using the crayon bundle. On a piece of paper, trace around the ice cream pail or pan and cut out to fit inside the pail or pan. Add a blob or two of paint onto the paper and add a marble or two. Move the pail or pan around to swirl the marble through the paint and around the paper to make designs. Tie a length of string around an empty toilet paper tube and secure in place with tape. Dip in paint and roll on paper to create stringed patterns. Adult to do the following: Slice a raw potato in half lengthwise. Place a cookie cutter on the cut side of one half of the potato. Push the cookie cutter into the potato while keeping the potato flat on the table. Break away the potato that's around the outside of the cookie cutter. Push the shape out of the cookie cutter. Dry off any moisture from the potato with a paper towel. Dip in paint and let your child have fun stamping! Ziplock Books: Put in pictures, letters, flowers or anything else you want in a book. Punch holes equidistant from the edges on each bag above the zipper part. Use whatever yarn or ribbon you like to thread the holes to bind the book. To make the pages "more firm" cut to size a piece of craft foam sheet or card stock and place in each bag. Kids love the idea of having life-sized pictures of themselves. Have your child lie down on a large piece of paper big enough to trace their outline with a crayon. Let your child decorate the picture of him/herself, drawing on a face, glueing on yarn etc. for hair, drawing clothes. This is always a favorite preschool art idea. All you need is crayons and brown paper bags to let your kids get creative with decorating their lunch/snack bags. They could also cut out shapes from construction paper to glue on their bags. You could make it a weekend project to have a supply of lunch/snack bags ready for the week. Here are some lunch box note ideas to stick in your child's lunch box to brighten his or her day. I also place them around the house for my children to find. Here are some more winter themed lunch box notes. To give uncooked pasta bright beautiful colors, squeeze 1/3 to 1/2 of a small bottle of acrylic paint(found in craft stores) into a large plastic ziplock bag(resealable bag). Pour in some uncooked pasta, squeeze and shake the bag until all the pasta is coated with paint. Pour out the pasta on newspapers to dry. After drying for a few minutes, rub the pasta between your hands to keep the pieces from sticking together. Print out or help your child print out their name with glue on a piece of paper. Have your child place colored pasta pieces on top of the glue to spell their name. Let dry and then tape on your fridge door. Or you could make a door hanger for your child's bedroom using the same idea. Have your child dip their hands in tempera paints and press their handprints over a large piece of paper. Trace around your child's hand on a piece of construction paper or cardstock and cut out to use as a gift wrap tag to go with the handprint gift wrap. Sprinkling confetti on glue always seems to be a favorite craft for little ones. Brush some thinned glue onto the sheet of paper where you want to sprinkle the confetti. Shake excess dots or confetti onto a piece of newspaper. Repeat until your design is covered with the dots or confetti. Let dry. This star shoots through the air when your child blows on one end of the straw. Have or help your child cut out a star shape from colored construction paper. Roll up a strip of paper 1 to 1 1/2 inches wide and approximately 8 inches long(Don't roll up the strip of paper too tight- the straw needs to fit into it). Dab some glue onto the back of the star cut out and stick one end of the rolled up strip of paper to the glue. Also tape the roll in place until the glue dries. Bend the straw at an angle and insert one end of the straw into the rolled up paper. Add some curling ribbon for decoration to the star. Just tape it to the back of the star. Add a positive little message onto the star if you like. Click here for preschool autumn themed crafts. Click here for preschool winter crafts. If you don't find what you need, then do a search using the search box below.